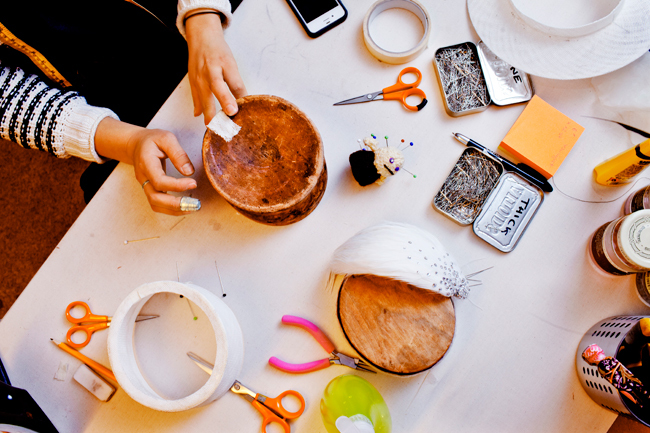 Award winning milliner (modist) Malinda Damgaard. Malinda Damgaard grew up in Gothenburg, Sweden, were she studied millinery at Tillskärarakademin — The Academy of Cutting & Tailoring. In 2005 she was presented with the Journeyman’s certificate and the Crafts Council reward medal. In 2006 Malinda moved to London to work for milliner Philip Treacy where she mainly worked on haute couture hats for nearly five years. She also went back and worked for Philip´s fashion show at Royal Court of Justice in September 2012. Malinda is based in Stockholm, Sweden, where she is working under her own label. She has created unique head pieces for prominent companies, and clients, such as Acne, Minimarket, Lady Gaga, Ida Sjöstedt, Royal Opera of Sweden and Lars Wallin. As well as private commissions for Crown Princess Victoria and Princess Madeleine. Malinda was awarded ELLE Sweden Accessory Designer of the Year 2013. The same year she was selected to host the prestigious radio show Sommarpratarna. She continues to focus on handcraft, high quality workmanship, and the best materials.